Julita Inca Chiroque: How do you Fedora? We recently interviewed Julita Inca Chiroque on how she uses Fedora. This is part of a series on the Fedora Magazine. The series profiles Fedora users and how they use Fedora to get things done. Contact us on the feedback form if you’d like to be a future interviewee. Who is Julita Inca Chiroque? Julita Inca Chiroque, an avid champion of open source and Fedora from Peru, started using Linux in 2009. Her childhood heroes are divided into creeds, comics, and personal. Her personal heroes were her mom, dad, and grandmother Agueda. The comic book heroes included ThunderCats, Spider Man, He-Man, Sheena, and Gigi. Her creed-related heroes include Jesus, San Francisco de Asis, and Santa Rose de Lima. Her two favorite movies are La vita e bella and Rocky. She admires people who are easy going, clever, disciplined, and have a good sense of humor. Inca is a master in computer science at Pontificia Universidad Católica and professor at UNI (national University of Engineering) in Peru. She is also a high-performance computing (HPC) researcher, a member of the GNOME Foundation, and a Fedora Ambassador. In 2012 Julita traveled to the Czech Republic for a hackfest. She participated with the GNOME Documentation team. She became aware of the relationship between Red Hat, CentOS and Fedora because the event was held in the Red Hat building. Inca was inspired to organize Fedora events after meeting Jiří Eischmann. Julita said, “I knew Jiří Eischmann from Fedora Czech Republic and I saw his work as organizer and I wanted to do the same in Peru.” She began working with Fedora LATAM to organize events, with Luis Bazan as her Fedora LATAM Mentor. Inca’s current focus is on young students interested in open source and Fedora. 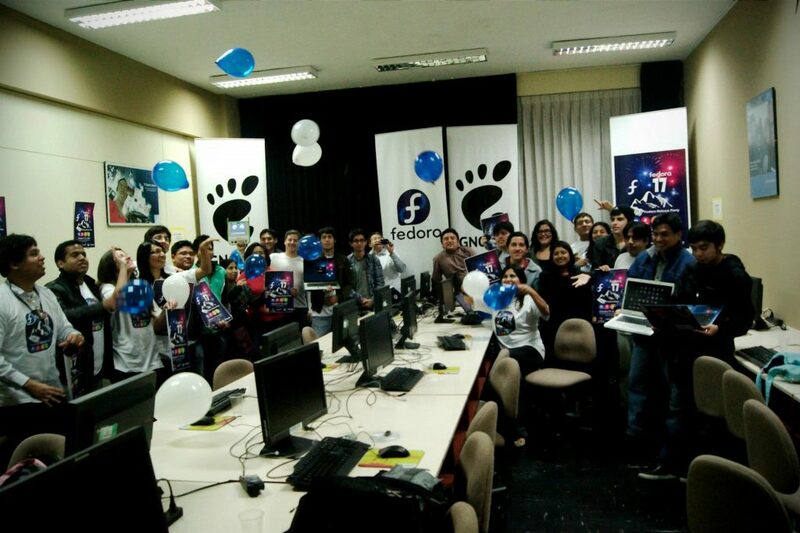 Julita organized the Fedora 17 release party, a five hour event, as her first in Peru. Activities included installation of Fedora and configuration of applications. The event also included a discussion on how to contribute to Fedora. More recently, Inca helped organize Hack Camp 2016 Fedora + Gnome, n conjunction with Hack Space Peru. 28 attendees hacked on GNOME and Fedora 23 during this event. She also held two workshops at CONEISC2016 promoting Fedora 24 and GNOME 3. Inca Chiroque wants to see a stronger on-boarding process for new Fedora contributors. Julita said, “It is crucial to have a good mentor-newcomer relationship.” She continued, “I feel like they are responsible for the first baby steps.” She stressed that balancing the demands of family, friends and work is crucial for new contributors. Julita’s Toshiba Satellite R85012G laptop runs Fedora 24. It features an Intel Core i3 2310M, 2GB RAM, AMD Radeon HD 6450M and 15.6″ screen. She also uses Pidora on her Raspberry Pi 3 to research performance. That unit includes an ARM Cortex-A53, 1.2GHz and 1GB RAM. She also has an Arduino and an Apple Macbook. She regularly uses software such as Gimp, Python, Cloudera, Hadoop, Spark, and Virtual Box. Her long term goal is to simulate and calculate the routes of airplanes using HPC. Inca’s first step is to run Hadoop and Spark on the Raspberry Pi 3. Fedora Project community	Fedora AmbassadorsHow do you Fedora? She is Super Fed Woman, impressive. Wow. She’s quite an impressive person. I agree. I was very impressed in the interview. @Akinsola, @dextre, @Todd and @Charles, thanks for your comments. Hope to see you there, we are going to publish the agenda soon! Teachers are always role models..
Muy impresionado por tu labor con Fedora. Saludos desde Lima y muchos exitos. Have you been in Borobudur Indonesia? I saw ur picture above , the place is similar with Borobudur, an old budhist temple in my country. Read your activities in the article, it is amazing… You’re done great jobs there.. Keep the good works.